When Allan Davis and Babs Raftery of Mr. Peepers mini-shop in Seattle asked us in 1981 to come up with a project for teaching our aging techniques, we had no idea of how much we didn’t know. They insisted that whatever we did, the students would love it, and to dive in. As that had been our basic M.O. for the past 7 years, we took the plunge, thinking our biggest problem was coming up with a building small enough to teach. Our idea came across the breakfast table as we were looking out the window at our full-size aging 1920s 2-car garage that tilted a bit to the north. It was single-walled and unfinished inside, shingled on the outside, with a composition roof full of dry-rot and moss. A stairway at the back lead up to a bare-bones apartment with a main room, a bath, and a kitchen under a shed-roof dormer. If we pared it down to a 1-car garage, and made it an exterior-only class (they could finish the inside at home on their own), it just might work. We did a test run by adding a garage to our Megler Landing house. Our full-size garage had a dirt floor and driveway, but a wood floor and brick drive seemed the better way to go, design-wise, and besides, we had cases of brick tiles to use up. 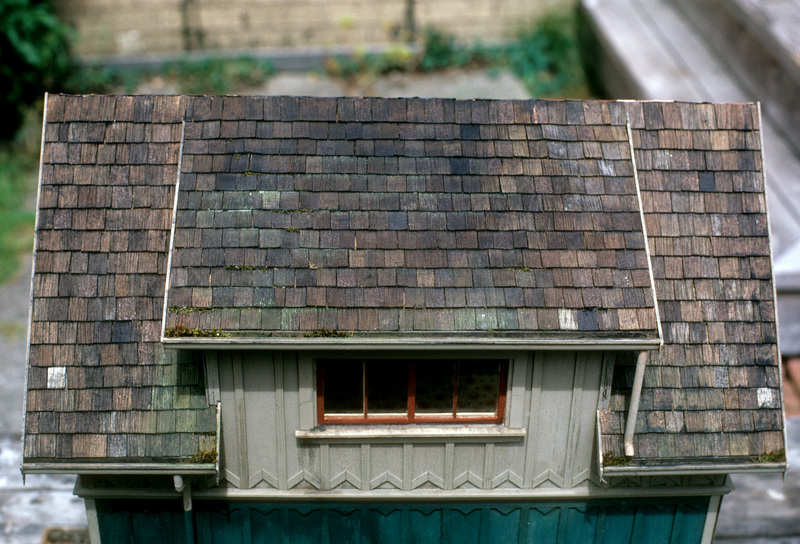 We opted to change the roof to wood shingles, along with the front wall over the door. To make the building more interesting, we decided on board-and-batten siding (vertical battens applied to the plywood walls), dressed up with some Carpenter Gothic inverted chevron and triangle trims, so simple Noel made them free-hand, practically with his eyes closed. We liked it so much we went to work on the class prototype—a slightly larger version that would give us room for the apartment, too. We called it the Model A because that was the only car small enough to fit through the doors. 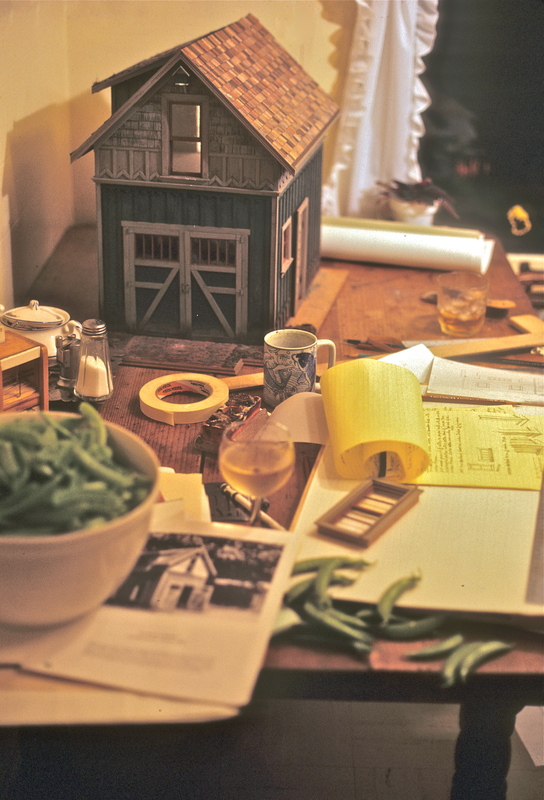 Once we were done, it was back to the kitchen table (the studio was too crowded with tools and the next big house), to break down the elements into teaching units, and make diagrams and instructions. By that time Ray Urh was into large-scale production of our mini-shingles—we’d never have finished prepping the class if we’d had to cut the students’ shingles ourselves. Then there was color–our prototype was green with gray accents, but, thinking maybe the students would want to choose their own colors, we suggested they think about it, and bring their own, or buy the paints at the miniature shop. While Noel built kits, I assembled elements, packed boxes, and practiced making chevrons so I could teach them, quickly finding out it was not so simple to cut 45% angles by hand with an Exacto knife. We didn’t have enough mitre boxes for the students, and that set-up took too much time anyway. Too late, we were committed. I don’t know who decided we could teach this in a weekend (it must have been a 3-day) but that’s what we advertised for. All of a sudden we had 20 enrollees, and we didn’t even have a classroom. All we knew was that we needed a readily available water source for the very messy work we did, and a floor that paint and Bug Juice stain could be spilled on. No problem, Allan said, you build the kits, I’ll find the space. Oh, and how about a slide show of your houses for one evening? He eventually convinced a restaurant near the store to let us use their back room, which was usually empty on weekends. He got it for free if we ordered lunch from their menu every day. Allan was even more excited because he could take the students for lunchtime drives around the parking lot in some of his antique cars. Finally, one September morning, there were 20 students from all over the country, awaiting our words and expertise. My mind has erased the emotions of that moment, other than the realization that we had no idea of what would come next. Each student had a box in front of them with the basic structure, diagrams, directions and all the supplies necessary—it was our idea that we would demo a process and they would set to work on their own, calling upon us as needed. We quickly found we had to teach, step-by-step, how to do what we did—the students were paralyzed with the fear of making a mistake. A very sweet woman from Los Angeles who showed up in a pastel cashmere suit smiled at my suggestion she might ruin it. She was somehow protected by mysterious forces that never let her spill or splatter a drop. The nearest water source was the Ladies Room, whose drains we clogged with paint. We modified the swirly-patterned rugs forever. Lunch plates and ashtrays cluttered the work tables. The people who strayed from our color choices hated them by day two. More than one person cried over the chevrons, and students took their projects back to their hotel rooms at night to shingle and brick, showing up bleary-eyed in the morning. Of course no one finished the project, but the amazing thing was they all thought it was fun, many to return as future students. And they loved the slide show, and touring around in Allan’s cars. When we came up for air, Noel and I went home jazzed with their enthusiasm. Jazzed enough to return for another 30 years of teaching. Addendum: Articles in the September and November 1981 issues of Nutshell News–the first two in my long-running series of how-to aging techniques–give more information on the Model A. You’ll notice some differences in the origins of the building, but if you ask me which is right, I’ll say both. 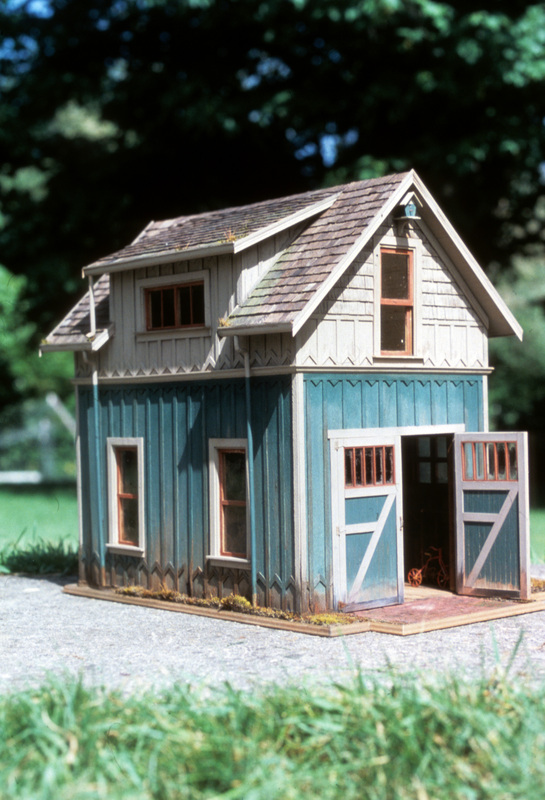 This entry was posted in Miniatures and tagged aging miniatures, Carpenter Gothic, miniature garage, teaching, work style. Bookmark the permalink. I can’t believe the Model A garage was your topic today. I acquired one a year ago from a friend who didn’t build it herself. I’ve wanted the garage for many years since I saw it at Mr. Peepers. I believe then the tenant had a boat inside rather than a car. Mine needs work, it had been stored before I bought it, and last week one of our cats knocked the whole thing down. Luckily it fell onto a recliner and isn’t too badly damaged. The roof came off and it was upside down and looked smashed, but thankfully not. I don’t yet know who will ‘live’ in the upstairs apartment, but I know they’ll be happy. I am really enjoying reading your posts and hearing the stories behind these wonders. The pictures are great, just wish there were more. They leave me wanting to see every room in detail to enjoy all the hard work and detail you have put into each room of each building. Thank you so much for sharing, both in your blog and in the magazine articles you have done and for teaching and in so many ways. You are both great treasures. I have enjoyed reading all your stories, but this is one of my favorites! Thank you so much for starting this blog and for all you have done for the miniature world over the years. 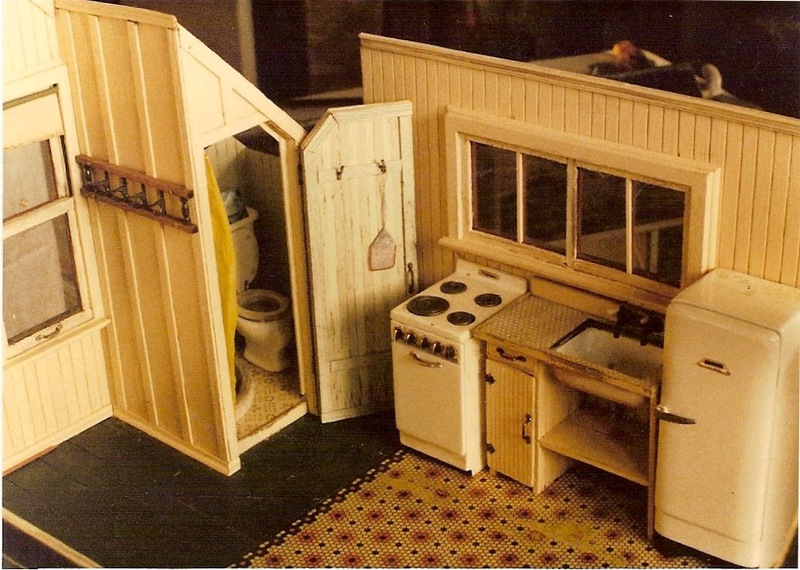 Did you make the fridge and stove from scratch? I need a fridge from this era, but haven’t been couragious enough to try to make one yet. Thanks everyone for the compliments–it’s always good to hear people are enjoying this. Melissa, yes, Noel did make the fridge, and the other appliances in this and other projects of ours. The fridge is a copy of the small one in our old garage. It’s carved from Jelutong, which is not, as it sounds, a dessert, or video game, but a wood available at specialty lumberyards. It is very fine-grained, has some heft to it, and is easy to carve. He carved and sanded the basic shapes, sprayed it all with dark gray auto primer, then with multiple coats of white enamel to make it look like metal. Time-consuming, but the effort is worth it. I wrote about it in more detail in the January 1991 issue of Nutshell News. Happy New Year, and happy reading. Thanks for the info – I’ll have to look for that issue of Nutshell News. The earliest I have is 1993. I have been a secret admirer of your buildings and methods ever since I saw your building at Mr. Peepers. wow, so long ago. I still wish that there was a store like that now, or is there one near me ? Not since the Country Store in Vancouver closed. I opened a small one here in Battle Ground but it didn’t get off the ground. I can’t affored the advertizement costs. But Oh, that is not what I am writing about. I say, please don’t give up on us old folk who admirer you and your work. Ps I have the neatest picture of you both, at a N.A.M.E. Convention in about 198? I feel extraordinarily privileged that I actually stayed in that “bare-bones apartment” – which I remember as a very sweet little space. Hi Jody, I’d forgotten you stayed there. It was cozy, and did have a certain charm, like and old, funky boat cabin. Last time I drove by it was still standing, but just barely.